At the feet of the most highlyrespected Lama, the source of all happiness and guide for suffering sentient beings, I bow down with my body, speech and mind. I am so fortunate to have met you in 1992. Before meeting you, all my actions of body, speech and mind were only causes for more suffering in future lives. After meeting you, I am like a wild animal that has found rest and is cared for by a great savior. 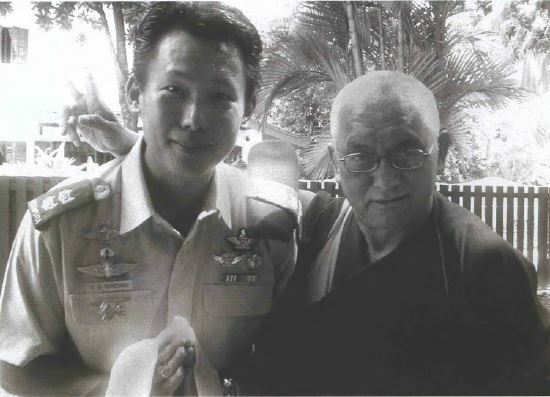 In 2000, when Geshe Lama Konchog was diagnosed with cancer, I made a promise to you in Kuala Lumpur to liberate one million lives for Geshe-la’s quick recovery Since then till today, for almost eight years, members of the Amitabha Buddhist Centre (ABC) in Singapore and myself have had the good karma and condition to liberate about 80 million animals. I have reflected that if were not for the kindness of His Holiness the Dalai Lama, Lama Yeshe, and your kindness in starting a center in Singapore, all this would not have happened. I would like to request on behalf of all the animals, and members of ABC, that you must live long.